At any age, gardening can be a lot of work. It’s physically demanding for anyone, especially when it comes to those high-maintenance plants. Luckily, you don’t have to sacrifice beauty for a garden that requires a little less maintenance. Try Shrubs. Don’t “shrub” this idea off just yet – there are so many beautiful types of shrubs and bushes that can add a lot of character to gardens without the need for excessive attentiveness. Roses can be a low-maintenance shrub as long as you pick a proven low-care variety. Shrubs are among the most versatile of garden plants. They make for excellent ground covers, fillers or even container plants. Plus, if you’re lucky, you might just provide some tiny creatures a friendly wildlife habitat. Opt for Potted Plants. Not every plant has to go into the ground to make a beautiful landscape. 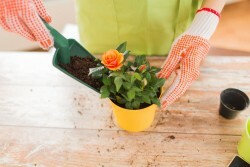 With potted plants, you can kiss weeding and raking goodbye! 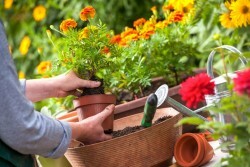 Do you like to change up your plants seasonally? This is a brilliantly simple way to cut back on that maintenance. Not to mention, mixing some elaborately decorated pots with your pre-existing garden can add some intriguing variety. Think Native. Plants will always thrive the most where they are meant to grow naturally. Do some research to find out which flowers are native to your area. Then, you can find ways to incorporate some of your other favorite flowers and plants to compliment your local seeds. Think about it: if the climate already allows for the plant to live and grow, how much will that cut back on maintenance? Probably more than you think. If you’re not ready to totally change what you see in your garden each year, don’t worry! There are still other ways you can reduce the work. Using a light layer of mulch can help to keep the weeds down or try some of these tips to plan ahead for next season. Happy gardening!